devorelebeaumonstre.com | Pittsburgh, PA | Fashion & Personal Style Blog by Stacey Belko: the bolder the better. I've been getting sent a lot of sweet as F jewels lately & not to sound like a broken record, but jewelry is my favorite. Obnoxiously large statement necklaces like these two pieces from Taara & She Inside are completely ideal for my everyday wardrobe in the upcoming months when all I wanna do is throw on cut-offs & a graphic t-shirt or tank. Add a bold necklace & I'm ready to go. Beautiful finds! Really great for everyday! That sounds like the perfect summer look! I love both of these pieces too. These are gorgeous, love the one on the left! they´re such an amazing statement pieces to add on any outfit. Great choice! LOVE the statement necklaces! Need to get more! I loved the necklaces are beautiful, I do not know which one I like most is that! Great pieces, love that one on the left especially. I totally agree with your post title! ohhh i love both of these! i completely agree, a big statement necklace can completely change an outfit and make an outfit! Statement necklaces are where it's at! Such an easy way to take an outfit up a level. I've tried to do bangles but they're not for me. My hope is someday to have a Dannijo bib in my possession. You & me both! I'd kill for a Dannijo necklace. Oh, love love love.. I´ve been questioned a few times for designing big statement pieces but they just don´t know what they´re talking about! 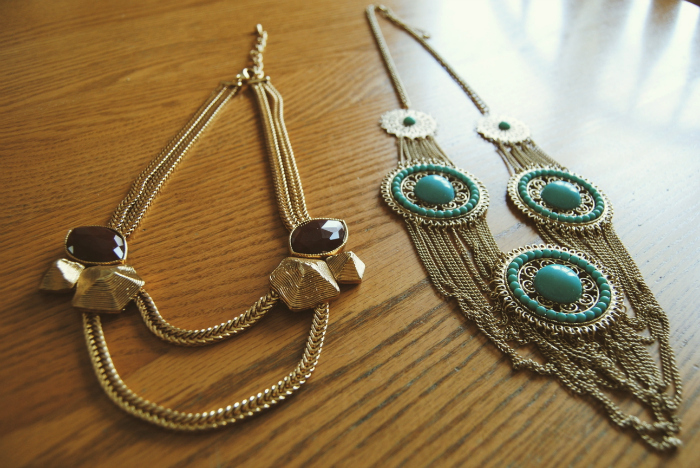 The necklace on the right is such a beautiful statement piece.